Tom Cruise has a new film coming out. Yep, it’s another sci-fi one! If you guessed “Alien Invasion”, they you win a prize! That of being clued up on how sci-fi films works. Especially of they involve lots of action and explosions! Not only that, we end up in a sci-fi “Groundhog Day” type of time loop. Instead of trying to be nice to get out of the look, they seem to have to learn from the last time they went around the loop and figure out what to do to get closer to winning the war. That’s one way of looking at the film but after watching the trailer it seems more akin to Duncan Jones’ second film, Source Code. As every time he goes through the loop he learns more about the invaders, his own skills, and how to stop the invaders. 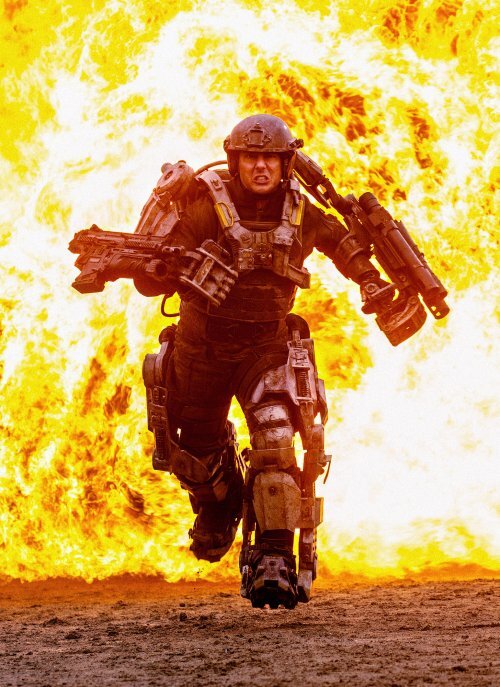 The film is based on the Japanese “light novel“, as was originally called, All You Need is Kill but someone thought it was a better idea to change the name to “Edge of Tomorrow“. Possibly to hint about the time loop or the need to save the Earth from destruction. The film also makes use of setting the film, to quote Max Headroom “twenty minutes into the future” to save on having to build sets and use a lot of CGI to make the world. We do see modern aircraft in the trailer. An Osprey is seen exploding at the start of the trailer as well as the, current, method of, quite literally, dropping troops into battle. Not only have we been sent the below trailer, we have the poster as well as a load of images to keep you amused. Major William Cage (Cruise) is an officer who has never seen a day of combat when he is unceremoniously dropped into what amounts to a suicide mission. Killed within minutes, Cage now finds himself inexplicably thrown into a time loop—forcing him to live out the same brutal combat over and over, fighting and dying again… and again.